January 24, 2011 By Jimmie Davenport & filed under All Articles, Other Tactics & Training, Tactics/Training. Our K9 teams got the description of a murder suspect reportedly hiding in a desolate, brushy area near the Colorado River Bridge in southeast Austin, Texas. An Austin Police Homicide Detective had briefed us via cell phone that he’d received a tip that the suspect was awaiting a ride to Mexico to flee the murder charges. As the two K9 teams neared the bridge area, our air support helicopter, call sign Air 1, arrived on scene as well. We comm checked in and verified with the aircrew that both K9 teams were searching on the ground. The other K9 team deployed along the edge of the riverbank from the bridge, while my K9 and I deployed into the brushy hillside nearby. Both K9s locked onto the suspect’s scent almost simultaneously. The two K9 teams closed in on the suspect from opposite angles. As I got within 25 yards of the suspect, Air 1 began relaying to me minor direction and distance corrections toward the suspect. In the pitch-black darkness, this allowed my back-up officer and me to prepare for a possible confrontation with the suspect, including forming a quick “what-if” plan in my head if the suspect chose to shoot it out or flee from my team. This information was also helpful to the other K9 team, so they could angle themselves into a cutoff position. It was reassuring to hear the helicopter crew calmly tell me that they were watching the suspect’s actions (or lack thereof). Since it was pitch dark in a field covered with waist-high brush, it was great to know there was additional observation from the helicopter. I was able to slowly ascertain exactly where the suspect was hidden by the aircrew’s coaching and the dog’s alerting me to his general hiding spot. 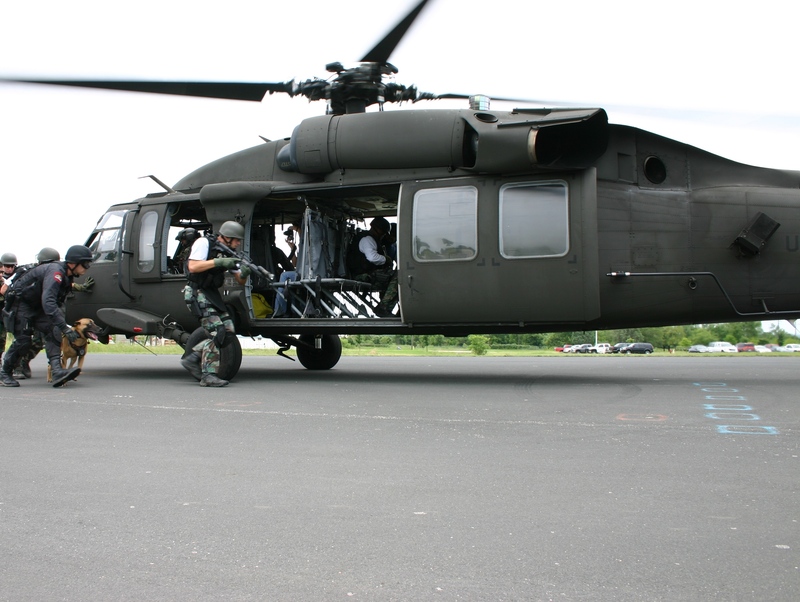 SWAT and K9 team training with aircrew. Eventually, I got to a position where I felt I could safely verbally challenge the suspect. When I radioed for the aircrew to illuminate the suspect with their spotlight, he reluctantly surrendered. I’m sure when he saw he was being watched by a police helicopter and an angry K9, he knew it was game over. This was a typical scene that’s probably played out every night in America: helicopters and K9 teams working together are law enforcement’s one-two punch in locating fleeing or hiding criminals. If you work for an agency or department that does not have dedicated air assets, you may find yourself working with another agency’s air support unit if you are called to assist in a critical incident in your jurisdiction (or theirs). It’s imperative to understand the aircrew’s language and convert it to K9 language. For instance, many K9 teams speak of general compass directions relative to a suspect’s location. “He’s in the wood line to the east of me” isn’t very descriptive to a helicopter orbiting at 50 knots at 500 feet. If an aircrew were to tell you to take a compass heading of X degrees and you’re in dense woods, the direction may not be obvious to you, and it’s all but impossible if you do not have a compass handy. 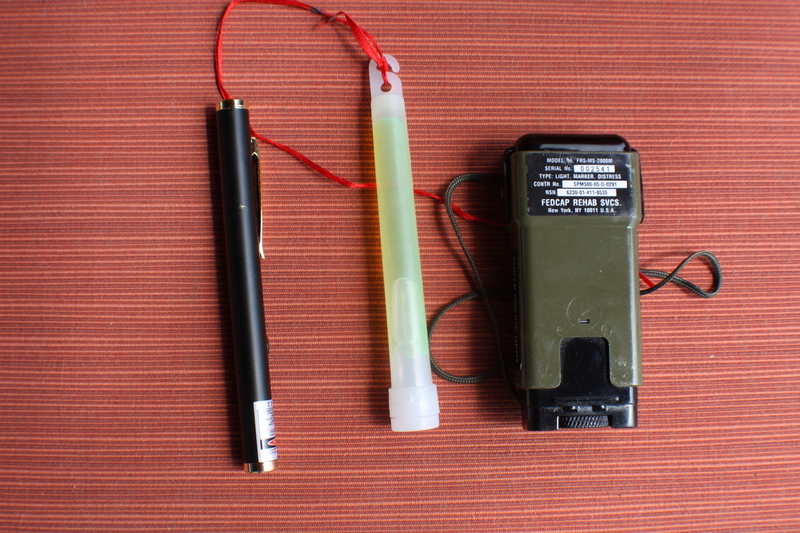 To help pinpoint suspect’s location as well as his own to an aircrew, author employs green laser pointer, glow stick and military-type strobe light. The obvious answers to this problem are, don’t create this confusion in the first place, and train with aircrews whenever possible. You don’t have to limit yourself to police helicopters either. Medical helicopters are often used to assist law enforcement in critical incidents, and in Austin we have trained with a locally based Army helicopter. While these different mission pilots have different backgrounds and terminology for their respective fields of flying, some common communications with K9 units are needed to help safely resolve an incident. I’m fortunate to work for an agency that employs two helicopters flownby dedicated police officers who are also helicopter pilots. Chief Tactical Flight Officer Tom Lopatowski of the Austin Police Department’s Air Support Unit has been flying with the Unit for seven years. He frequently trains with our K9 teams and as a result, both Units have developed some general guidelines in our communications with one another. Aerial view from FLIR of K9 team searching for suspect. There are some common errors in communicating with a helicopter traveling at 60 knots at 500 feet. Radio transmissions by a K9 team on the ground such as, “You’re over me now,” aren’t useful because the aircrew usually can’t see straight down and by the time they receive that transmission, they’ve covered hundreds of feet. This also applies to asking an aircrew to “look out to the right or left side of the aircraft and you’ll see….” If the aircrew isn’t clear on your request for observation, do you mean directly to the right or left? Look at a 45-degree angle off the right or left? Front right/left or rearward left/right? How far away from the aircraft? Factor in some low-level clouds and looking out for other air traffic such as news helicopters to avoid midair collisions, and the aircrews are hard pressed to look for vague references from officers on the ground. Through trial and error, I have found that carrying three pieces of gear helps me communicate to an aircrew my perspective on the suspect’s location. If it’s at night, I use a green laser pen to point in the general area I am getting a K9 alert or where I want the aircrew to investigate. I don’t have to be extremely accurate in pointing it at the suspect, but I can give the aircrew an excellent point of reference to the suspect. The aircrew can often confirm to me if there is something that the suspect can be in or under in front of the K9 team. I also carry a pair of glow sticks so I can throw one to mark a suspect’s position. This works well to assist officers around me to see where I am without having to illuminate my cover officers or me. The drawback is that the suspect may see where it comes from unless Infrared (IR) glow sticks are used. Helicopter crew locates suspect with gun using FLIR. The third piece of gear we are issued is military-type IR strobes to help aircrews keep track of us when we are under dense tree cover. The aircrews may not always be able to observe us, but the IR device helps give them some idea of where we are if we need help or direction. As the three-dimensional search for a suspect is occurring, K9 officers must be aware that aircraft have finite limits in fuel and flight time. Austin PD uses the Eurocopter EC120b, which Officer Lopatowski says has a flight duration time of approximately three hours. K9 teams need to be aware that if a helicopter has been flying for a period of time, the clock is ticking on its fuel status. You may get anywhere from three hours to 20 minutes of assistance, depending on how long the helo has been airborne. While this should not alter the K9 search and tactics, it is necessary data K9 officers should be aware of in case they need to call for direct helicopter assistance later in the search. Our aircrews inform us they are getting close to their minimums so we are aware of the approaching asset loss. FLIR photo of K9 team apprehending suspect. However, when the aircrew radios the K9 team that they have located the suspect and tries to help guide the K9 into an arrest posture, perimeter officer(s) hear this as well and suddenly rush in to arrest the suspect. This cuts part of the locating team in half by not having the K9 available and ready to deploy on the suspect. Sometimes I’ve seen the suspect flee from the arresting officers despite the helicopter’s presence. Even more bothersome is that these fleeing suspects will often turn and fight the arresting officer. Or worse, the suspect might flee and break the perimeter set up to contain him. This can lead to having to redeploy all the perimeter officers because containment has been lost and needs to be re-established. But if a K9 had been assisting those officers, the suspect might not have been so quick to flee or fight. 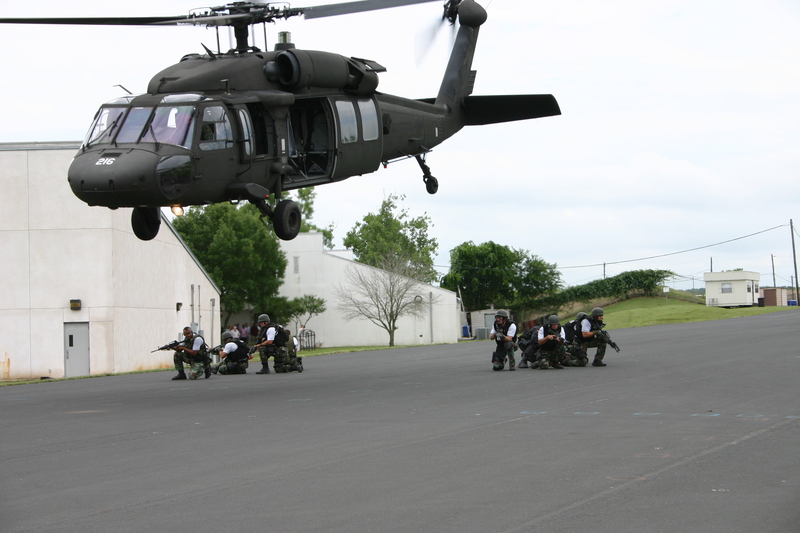 SWAT team practices deploying from Blackhawk. 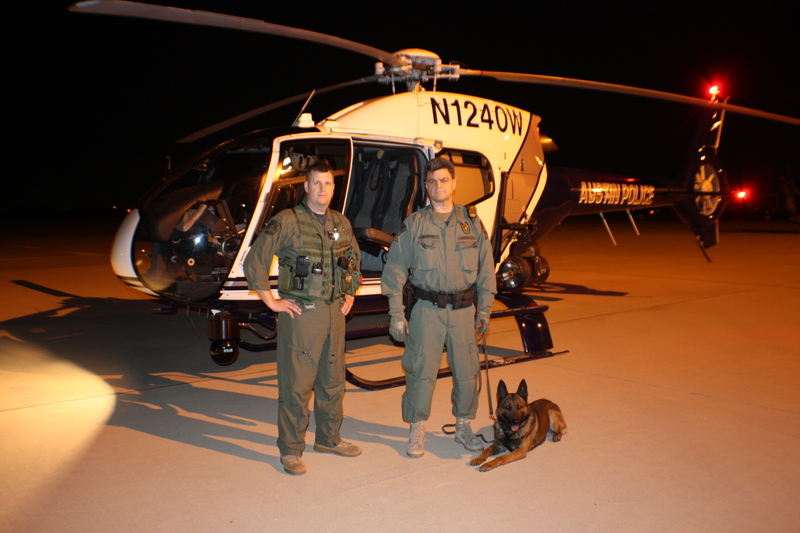 The aircrews are in the best position to direct K9 and back-up officers to the suspect. It’s interesting that, if for some reason Buck Fever starts, aircrews sound more “godlike” when they radio perimeter officers to stay put and not rush in. Even more importantly, it can be a safety issue if perimeter officers and K9 search teams are unaware of each other’s uncoordinated movements. Buck Fever has resulted in some officers later being treated for a K9 bite. Just as with all things K9 related, additional training with aircrews ensures a familiarity with the helicopters’ abilities, aircrew verbiage and tactics. It allows aircrews and K9 handlers to work out kinks and bounce ideas off each other. 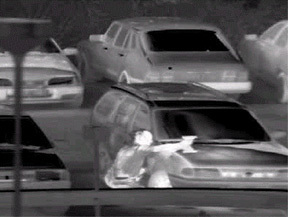 Later, this understanding of each other’s unique capabilities assists in safely and successfully capturing suspects. Aircrews have the same ethos as K9 cops. Our aircrews are as happy to capture someone “from above” as K9 officers are with their dogs. Wed the two entities together with training and dialogue to get a common language, and we will indeed expose and apprehend most crooks trying to hide from us.